My Pride Story: Ideological banner! Today in Pride stories: Our paths, that crossed for the first time with the people in our procession during that march, never parted. It’s 2012, a year has passed since we founded the Red of the Rainbow, together with a handful of people. The pride of coming out, finding each other and holding on together is not enough. The struggle is pushing us to producing politics, to going out on the streets. We want to see what our political claims correspond to in life. 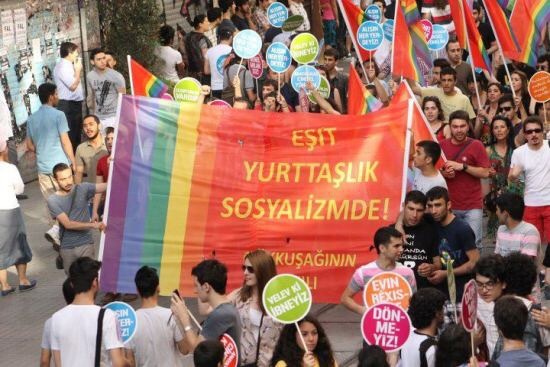 With the hope we mustered at the march we attended in Ankara, we rolled up our sleeves for Istanbul Pride March. We said we would walk behind the banner “Equal citizenship is in socialism!” After all, we believe in equality against discrimination, citizenship against pan-Islamism, socialism against capitalism. We have never gotten banners made in our lives and here I found myself in a flagmaker’s on Kazım Karabekir Avenue. Then off we go to Istanbul. It was time for Pride March. It’s our first time participating as an organization, we are excited of course. With our red rainbow flags and our banner, we joined the march from a point we saw fit. A friend, who we later on found out was a part of the Pride Week Organizing Committee did not take his/her time to ‘welcome’ us: “Your banner is ideological, you either take it down or walk at the back!” Only we were ideological among the thousands of rainbow flags, slogans against heterosexism, the tens of thousands who filled Istiklal Avenue, ultimately we are communists! The imposition of “Pride March above politics” is itself ideological, we don’t buy that! We said “We will walk behind this banner, through the crowd”. And we did what we said, we are communists after all. Our paths, that crossed for the first time with the people in our procession during that march, never parted. We were a few before the march, our numbers grew, even if [just] a little, after the march. We accepted being a few at the beginning, in order to grow. If we took down our banner that day, we would have given up altogether. Today we are not few at all, for we focused on growing our crowd and not on our banner. But we are still terribly ideological!